After watching from a desk at ESPN for nine years, Jon Gruden is bringing his ‘Chucky’ look back to the Silver and Black, as he’s going to be introduced as the new Raiders head coach on Tuesday. Gruden has already secured his defensive coordinator, as Bengals defensive coordinator Paul Guenther is coming to join him on his staff in Oakland. BREAKING: First reported by @CorkOnTheNFL…the #Raiders are calling a press conference for Tuesday at which they will introduce Jon Gruden as Head Coach. "I always knew he had an itch to coach again. I'm not a surprised and I am excited to see this." 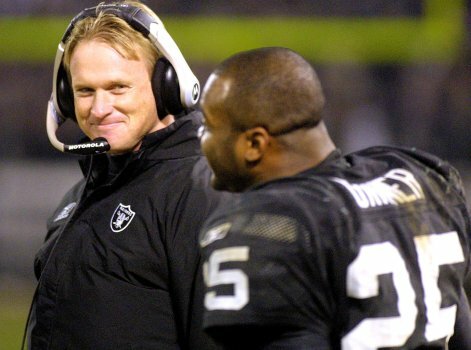 Gruden was the driving force behind the Raiders success in the early 2000’s, and it was a shame to see him on the opposite sideline while he coached the Tampa Bay Bucs to a Super Bowl win over the Raiders in the 2003 season. Now he will have a chance to make amends, coming back to the team that first took a chance on him and he will now get a chance to coach under Al Davis’ son Mark, instead of his father who first hired him. It will be interesting to see what Gruden does to try and make the Raiders back into winners like the first time he was their coach. The club fired Jack Del Rio on the last day of the season, simply to get their old coach back in the saddle. Raiders are giving new head coach Jon Gruden a 10-year contract, the longest coaching deal in NFL history, sources tell ESPN. The deal is likely to be worth about $100 million.